One of the greatest features of Hawaii is its amazing marine life. Sharks, dolphins, turtles, rays, eels, octopi, lobster, sea horses and endless varieties of fish await you at Sea Life Park and The Maui Ocean Center Hawaii Aquarium. 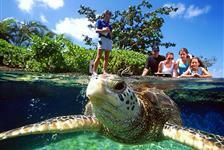 And you can save on admission to Hawaii aquariums and Sea Life Park in Oahu when you book online at ReserveHawaii.com. From up close views of turtles and sharks to dolphin swims to Hawaiian ray encounters, Hawaii aquariums and the Sea Life Park Oahu offer a variety of engaging and interactive opportunities for the marine animal lover in your family.